A lens hood is an often-misunderstood accessory by many photographers. Some say it has no function whatsoever and other people say it’s the most important part of the camera. Who do we believe? The truth of the matter is that it actually serves a very important function and that is to reduce light from reaching the front lens element from an acute angle. This has the same effect as using your hand to make a cover above your eyes when out in the sun. Before your hand was there, you couldn’t see much. Everything was overexposed, but then, once your hand is in place, everything is perfectly clear. Colors pop out, exposure becomes normal, contrast returns and most importantly, you can actually see again. This is exactly the same thing that a good lens hood does. It literally improves your photos immediately. The light coming at an extreme side angle to the lens is simply not important since our subject is in front of the lens. This means it can be safely eliminated and then the camera has less information to deal with. It also cuts down the chances of getting annoying lens flares considerably. There are times in studio work when a lens hood is totally unnecessary since the lighting conditions are completely controlled. However, it also couldn’t hurt to keep it on. Of course, another important benefit of Lens hoods and caps is to protect the lens. It helps shield it from bumps when getting out the car, putting it down on a table or accidently knocking it on something when framing. It also helps protect it from the elements like rain and dust too. Keep in mind that if your lens is not weather sealed you should never let it get wet – the front element needs to be bone dry and dust-free to deliver the best pictures. Many people shoot with their lens hoods in the reversed storage position and this serves no real purpose so don’t be one of those guys. Sure lens hoods are expensive but your lens was a lot more expensive – remember that! 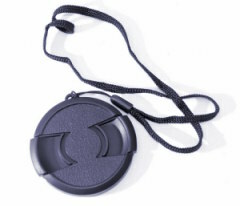 A lens cap is similar in that it provides protection from scratches and bumps and they come standard with most lenses and cameras. It protects standard and digital SLR camera lenses from dust and dirt while keeping them ready for shots. There are the pop-off type and the more secure aluminum screw-in type. These have nothing to do with light and are purely for protection. 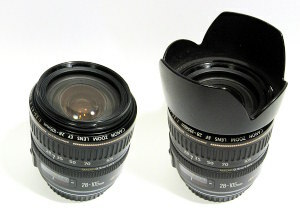 When you buy a cap is necessary to pay attention to the size of the lens, you must purchase a cap that has the same diameter as the camera lens to protect. That’s the benefits of lens hoods and caps.